Today’s blog focuses on some ways in which SBMI is helping health IT grow in these areas as we educate future informaticians and advance the field of biomedical informatics. SBMI has made incredible progress towards educating our students in the field of precision medicine as well as helping advance the initiative. Our school recently hired new faculty and built a central facility for our new Center for Precision Health. To supplement the new center, SBMI’s Dr. Doris L. Ross Professor Zhongming Zhao, Ph.D., M.S. has created a new seminar course which allows students to focus their research in precision medicine. Additionally, Robert H. Graham Professor in Entrepreneurial Biomedical Informatics and Bioengineering Hua Xu, Ph.D. was recently awarded a Precision Medicine Initiative (PMI) grant worth $894,367 as a subcontractor principal investigator on the National Institutes of Health (NIH) funded grant. SBMI is working productively towards advancing the innovative field of precision medicine on several fronts. At SBMI, we teach a course focused on Telehealth and we have several faculty members and adjunct faculty members whose research examines the field. As part of #NHITWeek, HIMSS invites everyone to make their voice heard and participate in a Virtual March on the States to contact elected government officials. This initiative is meant to raise awareness and help states work towards utilizing telehealth technologies to their full potential. More than half of the students currently enrolled at SBMI are women and we have female faculty members in leadership roles at both SBMI and throughout UTHealth. The university’s Human Resources Department also hosts Women in Leadership seminars to aid women in leadership roles at UTHealth. Both our school and our institution are working to provide women with opportunities to find advancement in health care higher education and the health IT field. SBMI offers joint degree and certificate programs with the School of Public Health to offer students the opportunity to bridge the gap between informatics tools and their application in the public health sector. For many of those students, they participate in practicums at the Houston Department of Health and Human Services so they can implement their health IT and informatics knowledge in environments where improving population health and epidemiological evaluation take place. 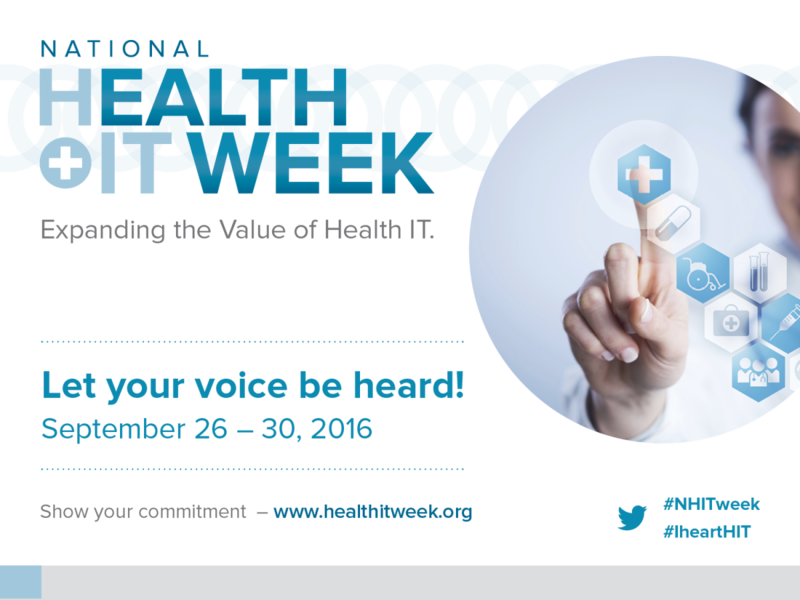 In conjunction with #NHITWeek, HIMSS is hosting a Student Advocacy Challenge this week. The school invited our SBMI students to participate by devising and implementing innovative advocacy activities focused on advancing public health IT awareness in their state or region. As #NHITWeek draws to a close, let’s remember the words of President Barack Obama. The President released a statement earlier this week noting, “Though there is more to be done to realize a healthcare system that fits each of our needs, I am confident that if we continue working together, we can build a future of greater health and prosperity for coming generations.” At SBMI, we look forward to the day where advocacy for growth in health IT is not needed as the industry reaches its apex. But until we have attained that level of success, SBMI will follow the example of our President and continue to education our students as they work towards improving the quality, safety, efficacy and ultimately, the future of health care.